We have received quite a number of questions regarding OF Hydra filter and Stream. Therefore we try our best to compile this brief FAQ and hope that it might answer some of your questions. Hydro Pure Technology works on a AOP (Advance Oxidation Process) to generate large quantities of Hydroxyl Radicals (OH●) in the water. In the typical aquarium water, equilibrium is maintained as per the below balanced equation. Meaning, if we have more Hydroxyl Radicals OH● being produced (right side), then we should have more toxic NH3 being converted to non-toxic NH4+, in order to keep the equation balanced on the left and right side. In short, Hydra’s main and immediate capability is to first, convert toxic NH3 to non-toxic NH4+. And with further Hydroxyl Radical (OH●) reactions within the water, the eventual outcome is Nitrogen(N2) and water(H2O). Within the process, harmful Nitrites are also accelerated to less harmful nitrates, then to Nitrogen. Some people will argue that NH4+ is also toxic for fishes. But it is true only if NH4+ is present in much more amounts, which is rarely possible. 1. What is Hydro-Pure Technology? • Hydro-Pure Technology is a patented water detoxifying and depurating technology for applications in both Marine and freshwater Aquatic Hobby. It consists of two electro-plates to energize a cartridge box containing special Cata-Pure Catalyst Media to generate strong reactive Hydroxyl (OH•) radicals, which is the key to the detoxifying and depurating reactions process. • Ammonia is un-ionized, and has the formula NH3. Ammonium is ionized, and has the formula NH4+. The major factor that determines the proportion of Ammonia or Ammonium in water is the pH of the water. Unionized NH3 is the form that can be toxic to aquatic organisms. The ionized NH4+ is basically harmless to aquatic organisms. 3. What are benefits of Hydro-Pure Technology? • Hydro- Pure Technology creates safe and stable pristine “Hydro-Pure Water” similar to that of natural river stream rich in micro nutrients and minerals. • It constantly pushes the ionization of toxic Ammonia NH3 into non-toxic Ammonium NH4+, thus greatly preventing fish kill due to toxic Ammonia. Ammonium cannot be absorbed into the fish gills. • It also helps to oxidize toxic Nitrites NO2- to non-toxic Nitrates NO3-, keeping it stable and at a safe level. • In the continuous usage, the Total Ammonia Nitrogen (NH3 and NH4+) will eventually become free Nitrogen N2 and water H2O. • Hydro-Pure Technology can also prevent cloudy water by the ionization of solid precipitation present in the waters. • It also removes bad smell by the oxidization of Sulphur-based products which causes smell in the water. • Hydro-Pure Technology is suitable for marine and freshwater fish tanks of all sizes, all types of fishes, plants and live corals and all levels of stocking density. It also helps in the prevention of “New Tank Syndrome” especially in Marine tanks application. Also suitable for all applications that requires pristine water condition of safe and stable level of Ammonia, nitrites and nitrates acceptable for aquatic lifeform. 4. Working principles of Hydro-Pure Technology. • The large amount of hydronium H3O+ ions reacts with the ammonia NH3. This is how the toxic Ammonia is detoxified to non-toxic Ammonium. 5. How long does it take to see the full effects of Hydro-Pure Technology? normally takes 14-21 days to see the full effects. Saltwater reaction time will be faster than freshwater as it has higher pH and higher water conductivity. 6. 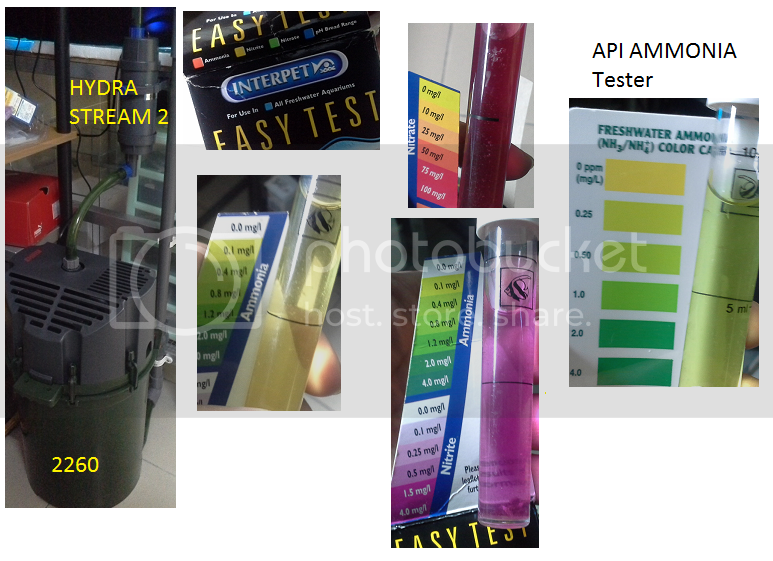 Why does Ammonia Test Kit read high levels of Ammonia after using the Hydro-Pure Technology products? normal that these test kit results in high readings as they measure total sum of toxic Ammonia (NH3) and non-toxic Ammonium (NH4+). Research has also shown that most aquatic plants are able to take in Ammonium directly for their nitrogen requirements. 7. Why does Nitrate NO3- level rises slightly during the initial phase of using the Hydro-Pure Technology products? • Hydroxyl radicals are more reactive to Ammonia and Nitrites and may be oxidized to become Nitrates. If the initial amount of nutrients, Ammonia NH3 and Nitrite NO2- in the water is higher, they will be oxidized first, to become Nitrate NO3-. Therefore, there may be is an initial rise of Nitrates, but it will gradually be reduced by H+ Hydrogen ions and fall to a stable and safe level. rocks, bio medias and heavily loaded Corals may be able to reduce Nitrate, thus they may not experience this effect. 8. Phosphate Test Kit may read same level of Phosphate PO4 after using Hydro-Pure Technology products. • Aquarium water contains both organic and inorganic form of Phosphate PO4. Hydro-Pure Technology has the capability to reduce organic Phosphate, especially in marine tank. However, Phosphate Test Kits available in the market are only able to test inorganic Phosphate. Algae only uses organic Phosphate. So some algae and Cyanobacteria might be reduced due to lesser organic Phosphate. 9. What is the effect of Hydro-Pure Technology on Trace Elements in aquarium water? • Hydro-Pure Technology may ionize these trace elements, making them more accessible and available to the corals, invertebrate and fishes because ionized trace elements are more absorbable for the organisms. 10. Is the Hydroxyl Radicals produced by Hydro-Pure Technology dangerous to organism, as compared Ozone? • Hydroxyl Radical (OH•) is the neutral form of Hydroxide ions (OH-). Hydroxyl Radicals are highly reactive but short-lived, with lifetime of a few micro-seconds. Hydroxyl Radicals are generated and reacted within the Cata-pure media. So they very safe and do not impose any potential hazards like Ozone. 11. What is the effect of Hydro-Pure Technology on Redox Potential level in aquarium water? • Hydro-Pure Technology can breakdown harmful components like Ammonia, Nitrite, Nitrate and many other nitrogenous compounds. Therefore, a higher Redox Potential may be experienced and is actually very desirable for coral culture, especially for SPS corals. 12. Will the Hydra kill or react with pathogenic bacteria and beneficial bacterial? • Floating pathogenic bacteria in water can be killed when they pass through the cartridge. However, good beneficial bacteria need to adhere to a media surface. They will not pass through the cartridge. Therefore Hydro Pure technology will not affect the beneficial bacterial in bio filtration system. 13. With Hydro-Pure Technology, does it mean that it is not necessary to use bio media to cultivate beneficial bacteria? • In any aquarium setup, the more filtration media we have, the better it is. It all depends on the aquarium setup and bio load. Depending on the extent of Hydro-Pure Technology usage, a reduced amount of Bio media is adequate for the tank system. 14. Effects of Hydro-Pure Technology on fish medications and long term usage. 15. Does Hydro-Pure Technology help to remove/ prevent algae in the aquarium? • Algae develop due to many factors such as high nutrients, high oxygen and lighting exposure…etc. Different types of Algae need different conditions to grow. Hydro-Pure Technology helps to reduce overall nutrient level, so it should help in algae problems to a certain extent, depending on the aquarium conditions. 16. Does it mean that it is not necessary to change the aquarium water at all after using the Hydro-Pure Technology products? • Hydro-Pure Technology helps to maintain stable and good quality water. 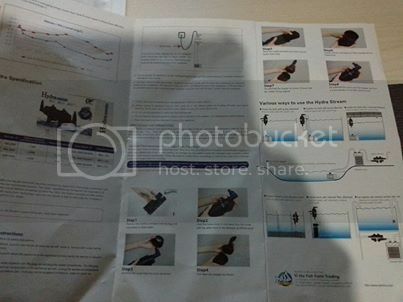 Therefore it will greatly reduce the frequency of water changes. The user will have to check the water quality regularly and determine if a partial or total water change is necessary. 17. Can Hydro-Pure Technology be used for Planted Tank Setup? • Yes. A well balance nitrogen cycled planted tank may develop algae in the first few days of using Hydra due to the fast depletion of nutrients. It is advisable to partially change about 10% of the water to prevent algae growth. Hydra will stabilize the water quality thereafter. 18. Does Hydro-Pure Technology affect the pH of the water? • Generally, there is no significant effect on pH of the water. However, in cases where there is extreme bio loading (fish, feeding) filtered with Hydro-Pure technology products only without water change, pH may fall slightly due biological imbalance as weak carbonic acid build up. In such cases, please perform water change. 19. Does Hydro-Pure Technology affect black water solution? 20. Does Hydro-Pure Technology affect vitamins additives? • Vitamin effects will be slightly reduced. 21. Does Hydro-Pure Technology affect water conditioner? 22. Does Hydro-Pure Technology affect trace mineral element additive? • Cata-Pure is the name of the Cartridge Media use in Hydro-Pure Technology. 24. What is the usage life of the Cata-Pure? • The Cata-Pure media can be continuously used for up to 12months. Regular interval of washing and rinsing is necessary to remove dirt within the cartridge. Replace the cartridges after every 12months for maximum performance. 25. Is the Cata-Pure made of just Activated Carbon/ Charcoal? • The Cata-Pure is a carbon based media that has been specially formulated with metallic additives to work with Hydro-Pure Technology. Replacing Cata-Pure with Activated Carbon will not work, and may even cause damage to the unit. You may perform the following test to compare Cata-Pure Media with activated carbon. 26. Do I have to clean the Cata-Pure Cartridge? • Yes. Regular maintenance is necessary to ensure that the Cata-Pure Cartridge does not get clogged with dirt. Clean the Cata-Pure whenever you are cleaning the filtration. 27. How do I clean the perform maintenance of Hydro-Pure Technology products? • Remove the Cata-Pure cartridge out of the Hydro-Pure Technology product. Rinse and shake the cartridge in water to release dirt. Clean the cartridge exterior. Clean the Electro-Plates surface. Reinsert the Cartridge into the product. 28. How often do I need to clean the Hydro-Pure Technology product? • A reduction in flow rate indicates a clogged system. Please inspect and clean the product on a regular basis. 29. Are the Electro-Plates replaceable? • The electro-plates are made of titanium and they do not need to be replaced throughout the entire operating life of the product. Regular cleaning is recommended for optimum performance. 30. Why does one of the electro-plate’s surface turns brownish? deposits. Please clean the electro-plate’s surface during maintenance. 31. Will I get an electric shock if I touch the Hydra’s Electro-Plates? • The Electro-Plates are powered by low level DC voltage which is safe and will not cause any electric shock. However, it is advisable that you switch off the Hydra’s Power whenever you are doing maintenance to it. 32. Can I modify the hydra’s electro-plates and Cata-Pure cartridges? • No. Do not attempt to modify or use the Hydra in any other ways. Serious injury may occur if you do so. We will not be liable for any damages inflicted to the human body due to illegal modifications and improper usage of Hydra Technology. 33. What is a Hydra Internal Filter? • Hydra Internal Filter is basically a normal Internal Filter build in with Hydro-Pure Technology capability. 34. Which Hydra Internal Filter should I use? • Select the Hydra Internal Filter base on the Flow rate and tank size you require for your tank. 35. How do I use a Hydra Internal Filter? • Hydra Internal filter need to be fully submerged into the aquarium water. It can be placed inside the main Aquarium Tank. It can be also be placed inside a Filtration system, example, a Sump Tank’s compartment, preferably after the mechanical filtration compartment. 36. What is a Hydra Stream? • Hydra Stream is an in-line canister adapter build in with Hydro-Pure Technology capability. It is used as an enhancement to the main filtration system. It needs to be connected into the back end of a filtration system driven by a pump. 37. Which Hydra Stream should I use? • Select the Hydra Stream size base on the volume of water to treat. 38. How do I use a Hydra Stream? • Hydra Stream is an adapter unit. It is not a complete filter system. Hydra Stream should be connected to a filtration flow system, preferably at the backend, after the mechanical or bio-filtration phase. Example, at the outlet of a Canister filter. Hydra Stream can also be attached with a pump and submerged into a sump tank compartment. 39. Is Hydra Stream water proof? • Yes, the Hydra Stream unit is totally waterproofed and may be submerged into water. 40. Does the Hydra Stream have a fix inlet and outlet direction? • The Hydra Stream is designed as a pass through adapter. Any flow direction is fine. 41. Can I use a bigger Hydra unit on a small volume of water? • Yes you may do so. A bigger hydra will be more efficient and will not cause any over-reaction. 42. Can I use a smaller Hydra unit on a bigger volume of water? • Yes you may do so, but the efficiency will be reduced on a bigger volume of water. Last edited by D24; 19-08-2013 at 09:44 AM. Reason: Do not quote whole post unnecessarily. I am sorry I am just curious. Do the internal filter and stream have different replacement cartriages? If so, do the cartriages differs from model to model? This is regarding the setting up of Hydra Stream with a new Canister (new bio filtration system). You mentioned "Hydro-Pure technology will oxidize bacterial, but all good bacteria needs to adhere to a surface, those floating around would be very little in numbers, so Hydro Pure technology will not affect the bio filtration system." If i am adding commercial BB to help seed & establish the new Canister... should i turn off Hydro stream for 2-3 days whenever i dose the tank with commercial BB? You mentioned BB once adhered to the filter media will not be affected by the Hydra Pure Technology. My concern is the free floating commercial BB that i've added to speed up BB growth in the new canister being oxidized by the Hydra stream. Hydra filter and hydra stream are sharing the same size replacement cartridges. The liquid and powder beneficial bacteria product contain dormant stage BB and some enzymatic cell extract, thus Hydro pure technology will not 'kill' the content of the product. Why do i get a initial high ammonia reading after using hydra filter or hydra stream? Ammonia and ammonium are always in a balanced chemical equation. The charged(ionized) form (ammonium NH4+) is much less toxic to all fishes, and in the uncharged(un-ionized) form(NH3), it is highly toxic. The reason why you see a much higher ammonia reading is because all the common test kit will not be able to differentiate between the two forms. The fundamental working theory behind these test kits are the ability to bind the Nitrogen molecules in the water and produce a color difference and the binding ability of the test kit’s chemical is dependent largely on which form the ammonia is in. If the ammonia is in the un-ionized form, the bond between the Nitrogen and Hydrogen molecule is very stable and the bond will not break and thus, it will not be able to give an accurate (lower) reading (i.e. there will still be a lot of nitrogen molecules not being “read” by the test kit). As the unionized form of ammonia is converted to the much less toxic ionized form of ammonia by HYDRA, the test kit will be give a higher reading as the bond between the nitrogen and hydrogen molecule in the ammonium is less stable and easier to break to combine with the test kit’s chemical. That is the reason why the reading is higher, but as you can see, the fishes are not dying! In any normal circumstances, such high ammonia reading would have kill all your fishes (marine or freshwater ) and corals(marine) but HYDRA converts all these toxic substances (actually it detoxifies many other nutrients in the water that pose a threat to your fish survival) to a much less toxic forms and most importantly, these ionized forms of nutrients are taken up by beneficial bacteria and plants at a much faster and efficient rate! For those who wants to test out the HYDRA further, you can run a control tank without HYDRA, you will see the wonders that HYDRA do! !